We forget that the water cycle and life cycle are one. Once a pristine coastal salt marsh, the Los Peñasquitos Lagoon is now considered a managed system in an urban setting. Reconstruction of the Lagoon’s ecology from sediment cores indicate that Los Peñasquitos Lagoon remained open to the ocean year-round, though temporary closures most likely occurred. 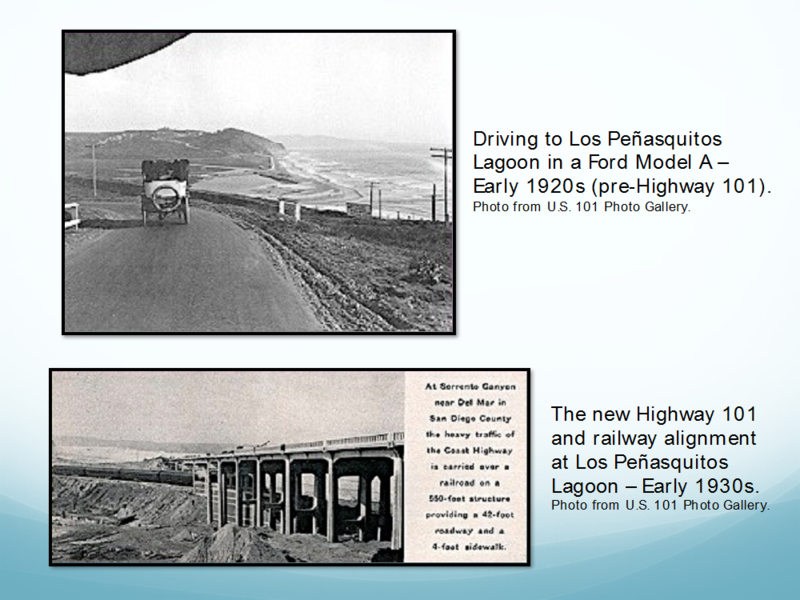 However, the construction of transportation infrastructure within the Lagoon and along Torrey Pines State Beach altered the natural hydrology of Los Peñasquitos Lagoon and its connection with both its watershed and the ocean. As a result, the inlet was subjected to frequent inlet closures that often extended for several months and, in some cases, more than a year according to sediment cores taken from the Lagoon and observational records kept by Lee LeGrange that date back to 1965. Mr. LeGrange was a local resident that avidly monitored the inlet status and often led shovel brigades to open it back up. He was also instrumental in making inlet management at Los Peñasquitos Lagoon a top management priority in the first Los Peñasquitos Lagoon Enhancement Plan, certified in 1985. What kept the inlet at Los Peñasquitos Lagoon open naturally? As mentioned, long-term records captured in sediment cores taken from Los Peñasquitos Lagoon indicate that the inlet remained open all year, although temporary closures most likely occurred for short durations. Storm runoff following rain events can scour inlet sediments as flood waters exit the inlet of coastal estuaries and is often the main driver for natural openings, especially in Central and Northern California. Having three sub-watersheds, Los Peñasquitos Lagoon most likely benefitted with regard to receiving higher volumes of storm runoff than other lagoons in San Diego County that only have one single drainage basin. Tidal prism (the volume of water that enters and leaves the lagoon during a tidal cycle) also plays an important role, especially for coastal estuaries in Southern California where rainfall amounts can be limited. When streamflow (runoff from rain events) and tidal prism are compromised, then inlet closures will happen more often and usually require mechanical excavation of the inlet to remove sand and cobbles. Why does the inlet at Los Peñasquitos Lagoon close? 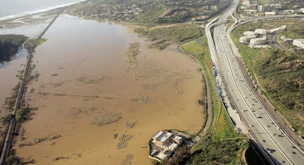 As an intermittent coastal estuary (or lagoon), Los Peñasquitos Lagoon was vulnerable to seasonal closures as winter waves and spring tides push sand into the Lagoon. However, under natural circumstances, it appears that the inlet never remained closed for long durations. 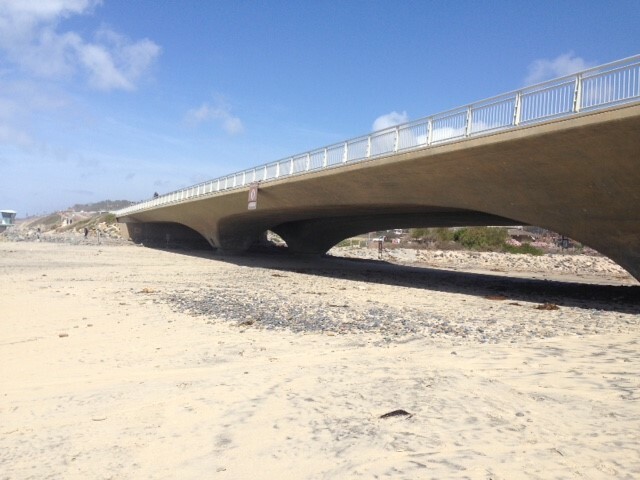 However, this changed with the placement of transportation infrastructure within Los Peñasquitos Lagoon and along its western border at Torrey Pines State Beach. 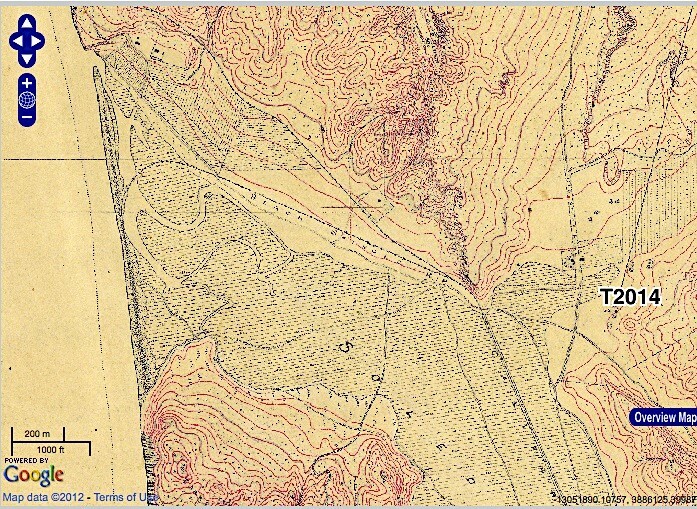 The placement of the 1888 and 1925 railway alignments through the Lagoon greatly altered the natural hydrology of Los Peñasquitos Lagoon. Constructed on top of berms made of compacted fill, the railways cut off historic tidal channels and hydrologic connectivity with the watershed. As a result, the tidal prism was greatly reduced and lagoon outflows following rain events no longer scoured the inlet to remove accumulated sand and cobbles. Sediment cores taken from the Lagoon show a higher frequency and volume of finer sediments within the Lagoon following the completion of the 1888 and 1925 railway alignments, indicating a higher frequency and, most likely, duration of inlet closures at Los Peñasquitos Lagoon. 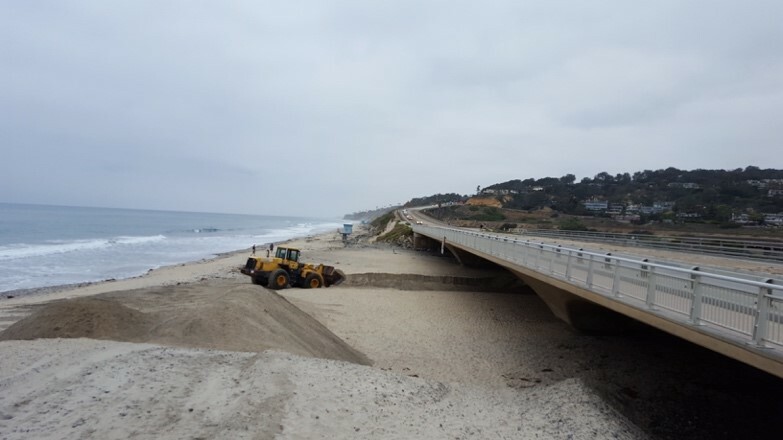 With the construction of Highway 101 in 1932, the inlet at Los Peñasquitos Lagoon became fixed at its current location, under the lower bridge along the section of Highway 101 referred to as North Torrey Pines Road. Relocated south of its original location (where the upper bridge is located) and unable to meander, the natural hydrology of the Lagoon was further altered and the inlet at Los Peñasquitos Lagoon experienced both frequent and extended inlet closures captured in sediment cores and observational records taken by local resident Lee LeGrange dating back to 1965 that recorded some closures lasting over 1 year. Transportation infrastructure at the inlet of Los Peñasquitos Lagoon. Photos by U.S. 101 Photo Gallery. What happens when the inlet at Los Peñasquitos Lagoon closes? While aquatic species native to intermittent lagoons like Los Peñasquitos Lagoon have adapted to hypersaline conditions, anthropogenic impacts to Los Peñasquitos Lagoon greatly impaired the Lagoon’s habitats and the ability of these species to survive. Daily discharges of primary treated sewage from three treatment plants between the 1950s and 1972, followed by numerous sewage spills from Pump Station 64 located in Sorrento Valley left legacy pollutants of nitrates and phosphates in the sediments of Los Peñasquitos Lagoon’s channels that expedite the depletion dissolved oxygen (DO) in Lagoons channels during inlet closures. As a result, DO levels can drop to toxicity levels for aquatic species within a week during optimal conditions (e.g. cool weather) or in a manner of days during warm weather when respiration rates increase. When this occurs, populations of aquatic organisms can be devastated and valuable food sources for Los Peñasquitos Lagoon’s birds, both endemic and migratory, are lost. Rapid urbanization of the Los Peñasquitos Watershed that began in the late 1980s introduced additional anthropogenic impacts to Los Peñasquitos Lagoon that included dry weather inputs of freshwater associated with irrigation runoff. Since 1995 these freshwater inputs have occurred daily, resulting in habitat conversion and the introduction of Culex tarsalis, a freshwater mosquito that can transmit brain encephalitis (e.g. West Nile Virus) to human hosts. During inlet closures, these daily dry weather flows convert Los Peñasquitos Lagoon to a brackish regime instead of a hypersaline regime typical of intermittent estuaries in San Diego and water levels continue to rise, eventually topping channel banks. As a result, nesting and foraging habitats for the Lagoon’s listed bird species are lost to inundation and the Lagoon’s sensitive salt marsh plants are impacted due to lowered salinity levels that allow invasive and brackish plants to dominate areas of historic salt marsh. In addition, populations of Culex tarsalis explode exponentially, creating a significant threat to public safety within a 2-mile radius of the Lagoon. View of the closed inlet at Los Peñasquitos Lagoon. Photo by M. Hastings on 3/1/16. 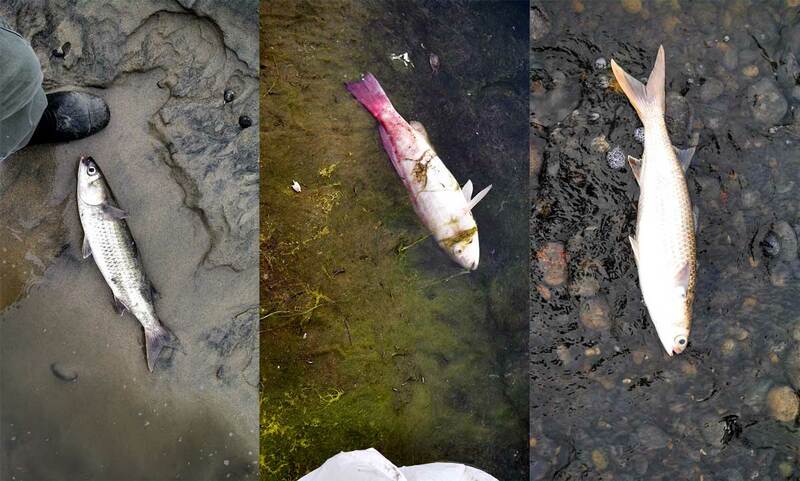 Dead fish in Los Peñasquitos Lagoon following an extended inlet closure in 2013. Photos by Mike Hastings. How do we keep the inlet at Los Peñasquitos Lagoon open? 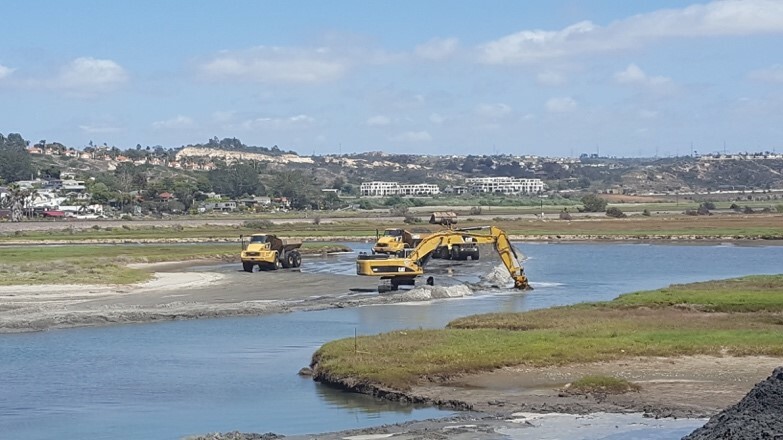 Since 1985, the Los Peñasquitos Lagoon Foundation (LPLF) has adaptively managed the inlet at Los Peñasquitos using heavy equipment. The current approach has built upon lessons learned from efforts conducted by State Parks since 1964, a technical analysis developed through the 1985 Los Peñasquitos Lagoon Enhancement Plan, and ongoing adjustments required for changing beach and inlet conditions. Studies conducted since 1995 indicate that inlet maintenance is best suited for spring time (March – May) to ensure that the inlet remains open during summer months while avoiding large winter swells that can quickly close the inlet as sand and cobbles are pushed into the inlet and up the Lagoon’s main channels. Performing inlet maintenance during summer months can be performed, but is often complicated by the likelihood of increased recreational use of the beach and nearshore waters by the public. Two types of inlet maintenance approaches are employed at Los Peñasquitos Lagoon: Emergency Breaches & Emergency Openings. Emergency breaches typically involve cutting a small outflow channel just east and west of the lower bridge that spans the inlet to release impounded waters. 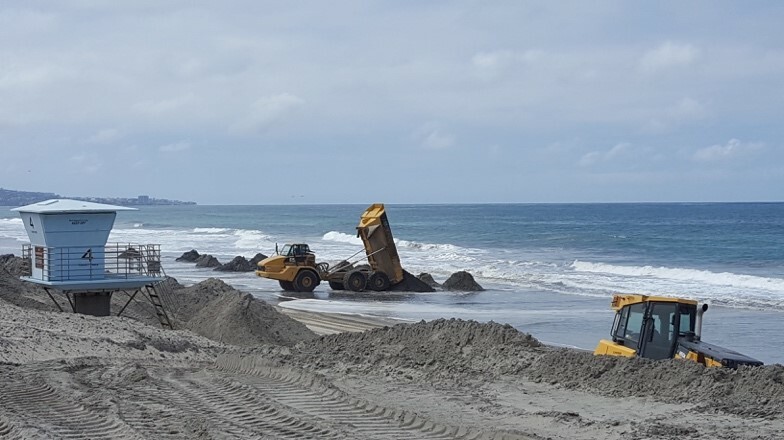 Typically, all excavated material (sand and cobbles) is pushed to the south of the inlet unless it can be hauled approximately 100 yards south for disposal in the nearshore area. 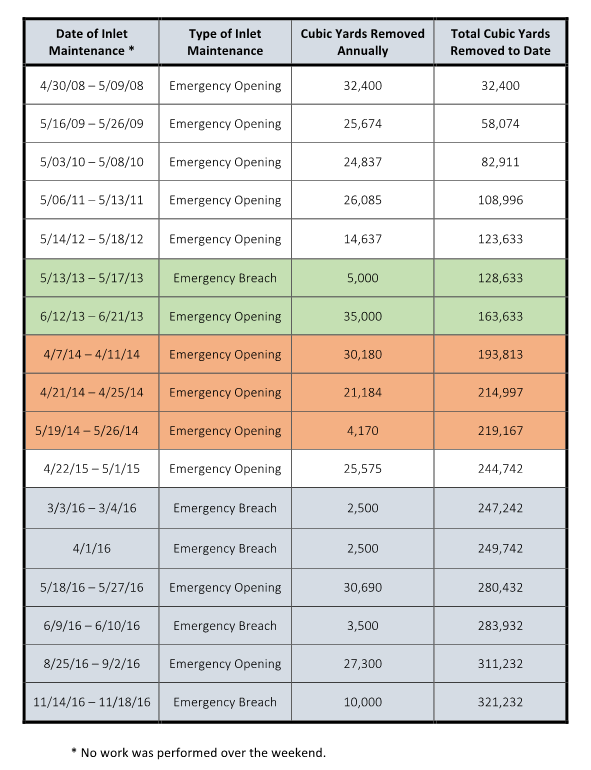 Emergency breaches are usually performed when closures occur before or, in rare cases, after spring months when conducting a larger maintenance effort (Emergency Opening) is not possible given the circumstances. 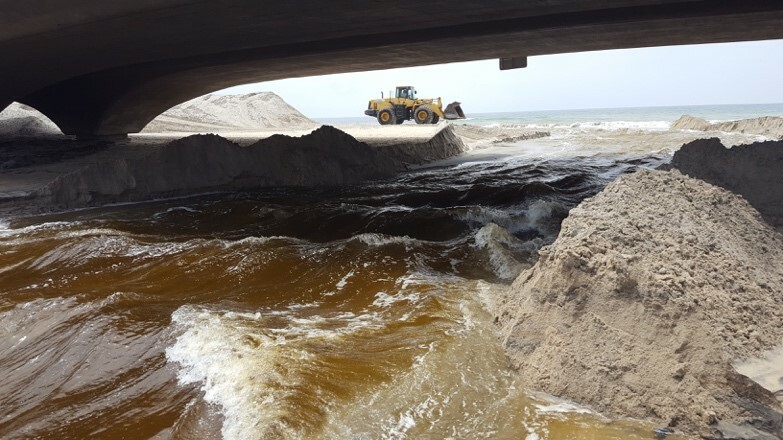 Experience has shown that conducting Emergency Openings during late fall or winter months still leaves the inlet vulnerable to closures in the spring regardless of the volume of material removed mechanically. In recent years, Emergency Breaches have been performed to protect public health and safety from vector-borne brain encephalitis by draining impounded waters that are conducive to the breeding of freshwater mosquitos that can transmit West Nile Virus. Keeping an open inlet is essential for reducing populations of this mosquitos, as well as to protect its sensitive habitats and the species they support. Cutting an outflow channel at Los Peñasquitos Lagoon on 5/18/16. Photo by M. Hastings. Release of impounded waters at Los Peñasquitos Lagoon at 12:35 pm on 5/18/16. Photo by M. Hastings. Emergency Openings typically occur once a year between the months of March and May. Typically, Emergency Openings involve the same effort as an Emergency Opening for the first day of work. 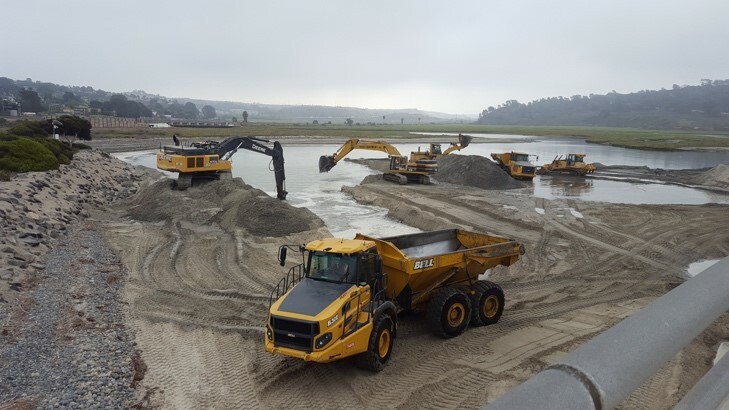 Once impounded waters are drained from the Lagoon, heavy equipment will move east of the lower bridge and find the eastern-most reach of shoaling sand. 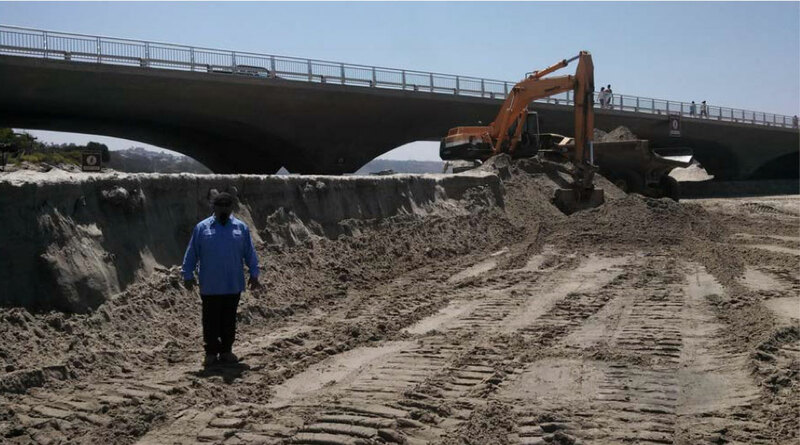 Excavation and stockpiling of material then occurs, with equipment slowly working its way back to the lower bridge over the course of the work period (7-10 days). 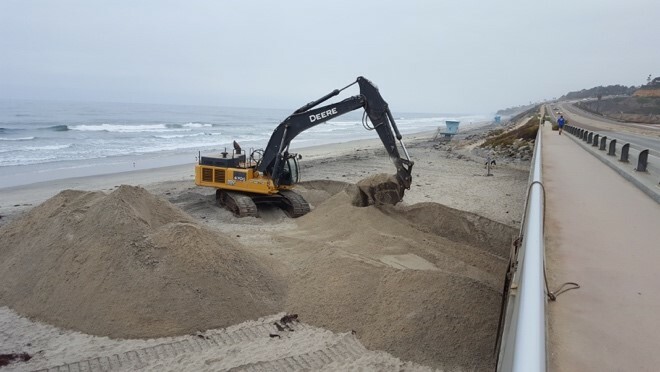 Excavated sand and cobbles are hauled south of the inlet along Torrey Pines State Beach for disposal to allow the longshore current to move material southward. 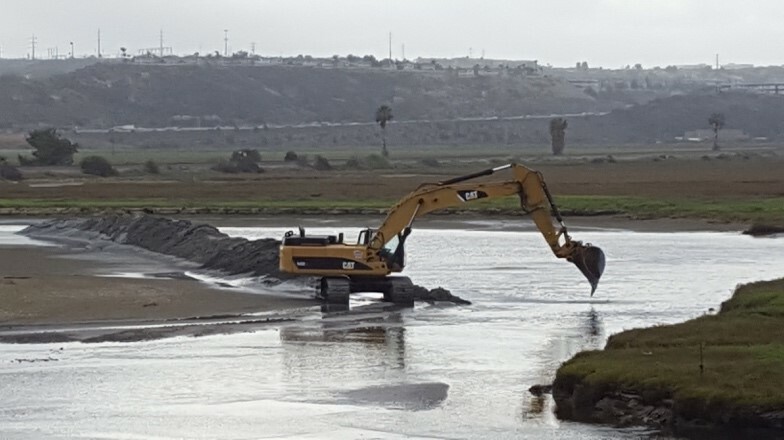 Excavating an outflow channel at Los Peñasquitos Lagoon west of N. Torrey Pines Rd along Highway 101. Photo by M. Hastings. Breaching the inlet at Los Peñasquitos Lagoon west of N. Torrey Pines Rd along Highway 101. Photo by M. Hastings. 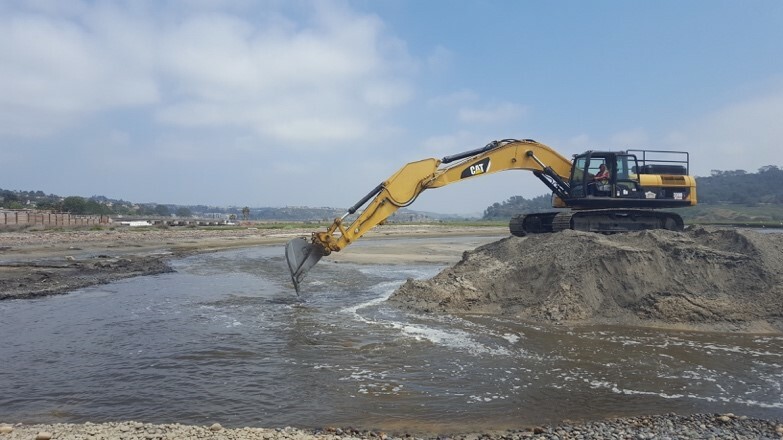 Excavating and stockpiling in the main northern channel at Los Peñasquitos Lagoon. Photo by M. Hastings. Excavating and loading of sand and cobbles within the main northern channel at Los Peñasquitos Lagoon on 5/23/16 at 2:43 pm. Photo by M. Hastings. Deepening the outflow channel at Los Peñasquitos Lagoon just east of the Highway 101 bridge on 5/19/16 at 2:10 pm. Photo by M. Hastings. 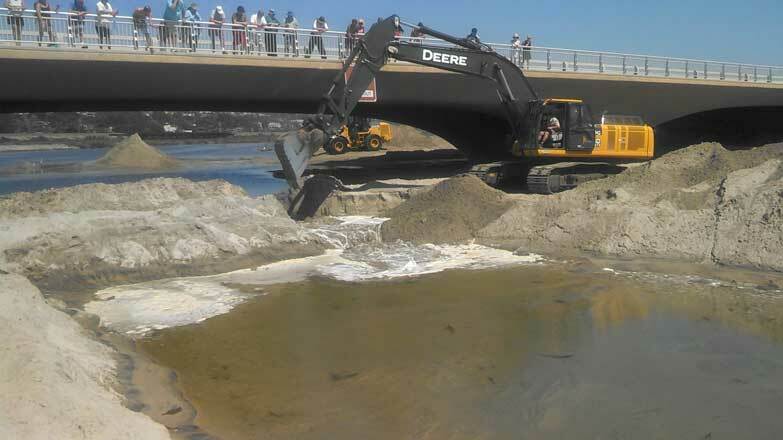 Deepening the main channel and lowering the elevation of the sandbar. Photo by M. Hastings. Loading out stockpiled sand on Torrey Pines State Beach. Photo by M. Hastings. Disposing sand and cobbles along the waterline at Torrey Pines State Beach. Photo by M. Hastings. 2016 to remove over 75,000 cubic yards of sand and cobbles from the inlet. It should be noted that in 2016, the inlet closed shortly after the 6th attempt to keep in open and remained closed until large rain events in December were able to re-open the mouth due to large volumes of storm runoff that scoured the inlet area. Volume of sand removed from the inlet at Los Peñasquitos Lagoon from 2007 – 2016. Graphic by LPLF. Elevated beach profiles at Torrey Pines State Beach in front of the inlet at Los Peñasquitos Lagoon as a result of downcoast drift from beach nourishment conducted by the Regional Beach Sand Project II in 2012. Photos by Mike Hastings. Should you be concerned about the impacts of future beach nourishment projects planned for North County San Diego? 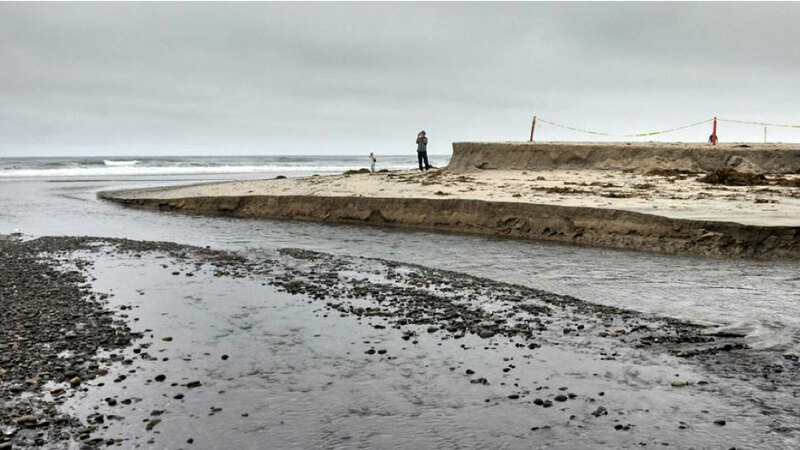 Multiple lines of evidence point to RBSP II as the key reason for increased sediment volumes in the inlet area of Los Peñasquitos Lagoon and elevated beach profiles along Torrey Pines State Beach between 2013 – 2016. While beach nourishment can provide benefits to tourism and protection of coastal infrastructure, it can also be devastating to coastal estuaries by augmenting sand volumes well beyond natural levels. Large waves strip local beaches of sand during the winter months and moves it southward in what is termed the Oceanside Littoral Cell, a nearshore area that is bordered by Oceanside Harbor to the north and marine canyons offshore of Scripps Beach to the south where sand is eventually deposited. 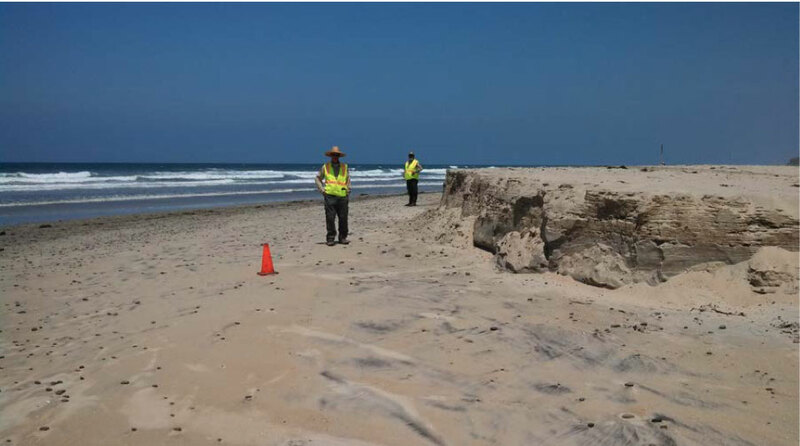 Located at the southern end of the Oceanside Littoral Cell, Torrey Pines State Beach receives sand from northern beaches as sand moves south. Unlike its neighboring lagoons to the north (San Dieguito Lagoon and San Elijo Lagoon), Los Peñasquitos Lagoon is not protected by offshore fringe reef that can intercept sand before it reaches the inlet. 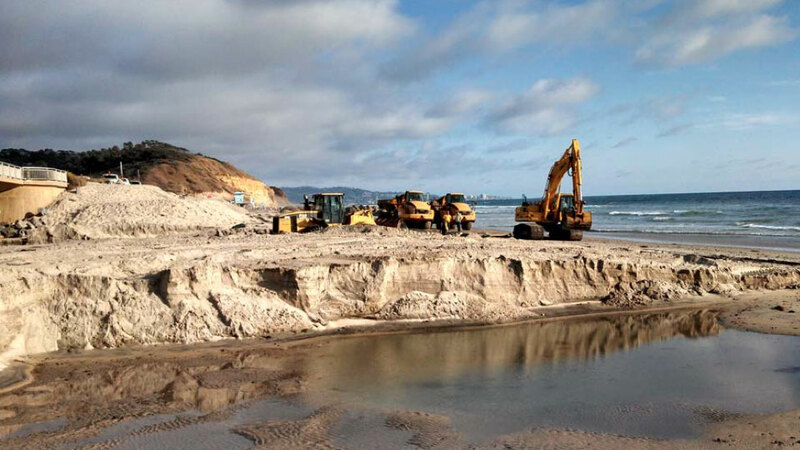 Instead, large volumes of sand enter the inlet at Los Peñasquitos Lagoon, pushed in by wave energy and storm surge that is much stronger relative to most of the beaches to the north. 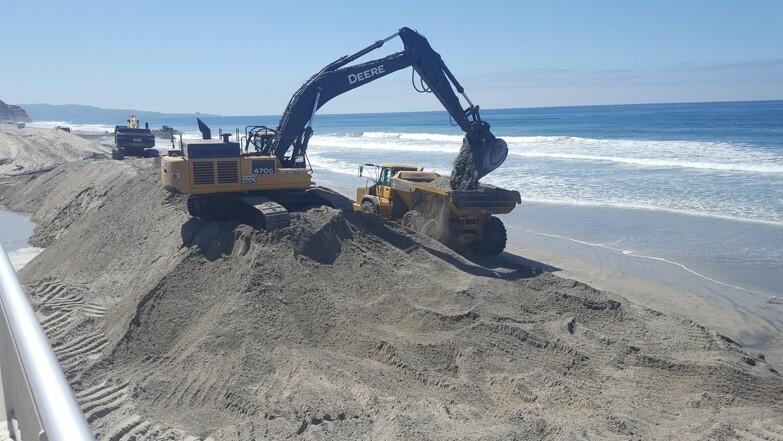 RSBP II placed over 300,000 cubic yards of additional sand along beaches in Solana Beach, Cardiff and Encinitas in the spring of 2012. Much of this sand made its way south before in subsequent years, ending up within Los Peñasquitos Lagoon. 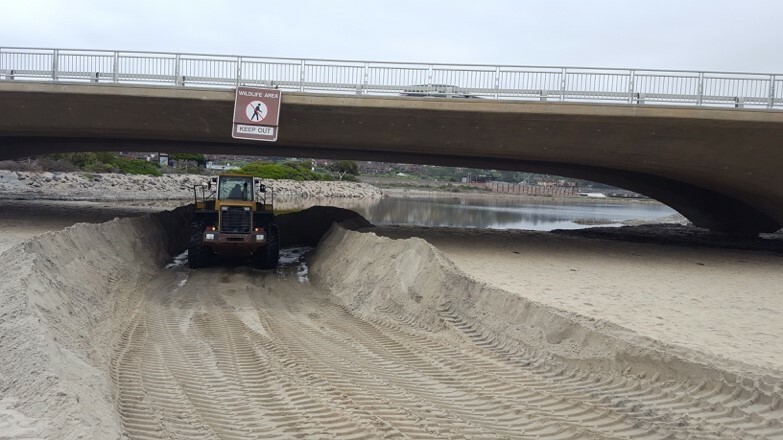 Inlet maintenance at Los Peñasquitos Lagoon is very expensive, with Emergency Openings operating on an annual budget of $150,000 to remove 25,000 – 28,000 cubic yards of sand from the inlet. However, this budget does not account for additional sand that must be removed following beach nourishment efforts such as RBSP II. 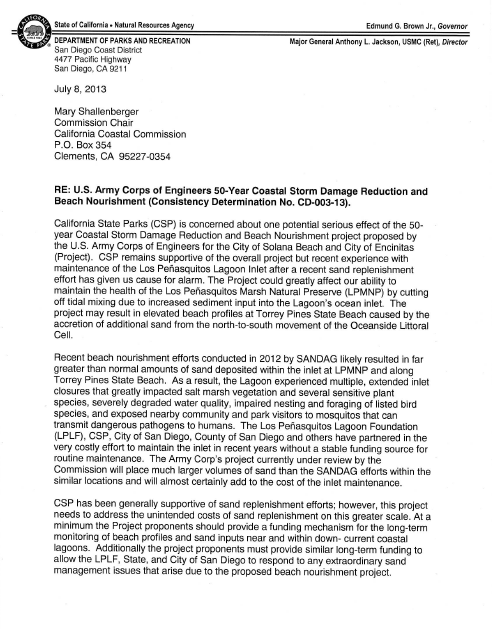 In 2013, 2014 and 2016, LPLF and State Parks had to scramble to find additional funding and leverage resources from other districts to open the inlet at Los Peñasquitos Lagoon following RBSP II. Even though the inlet was opened during these years, considerable damage was done to the native habitats within Los Peñasquitos Lagoon and the sensitive species that rely on them. Furthermore, airborne mosquitos with West Nile Virus were detected near the Lagoon in March 2016, creating a public health and safety issue for local residents and park visitors. Beach nourishment projects will most likely be the preferred alternative for protecting our coastlines before planned retreat becomes the reality, as predicted by many coastal experts. 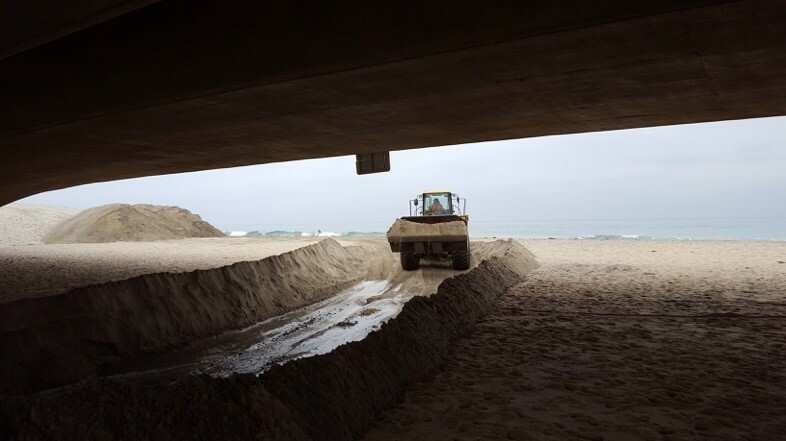 Currently, a massive project called the Encinitas-Solana Beach Coastal Storm Damage Reduction Project is being finalized by the Army Corps of Engineers for the City of Encinitas and City of Solana Beach that will place over 1,000,000 cubic yards of sand on beaches with additional placement every 5 years. This represents an exponential increase in sand placed on the same beaches under RBSP II, which showed us how downshore migration of sand can impact Los Peñasquitos Lagoon. 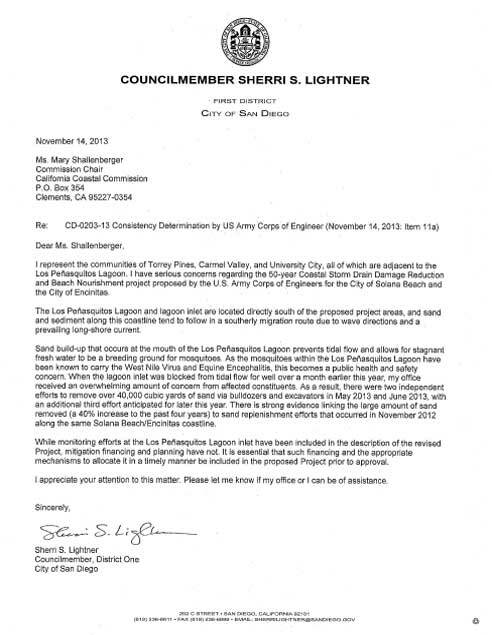 Impacts to Los Peñasquitos Lagoon will be far greater than experienced after RBSP II and, currently, the appropriate mitigation has not been provided to LPLF by Army Corps of Engineers nor the Cities of Encinitas and Solana Beach. 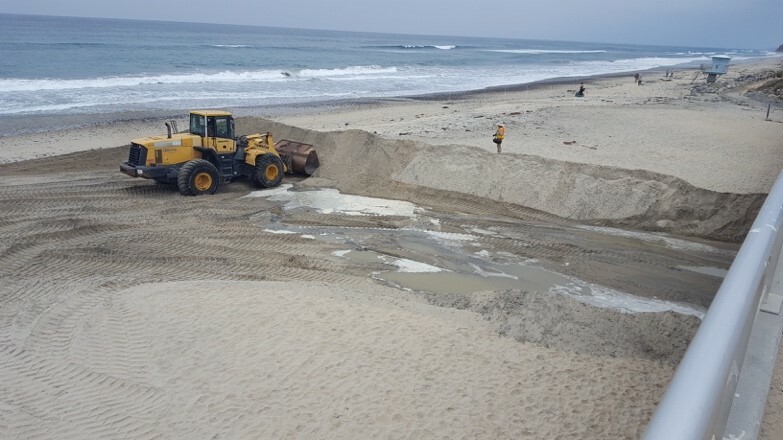 Left unchecked, the Encinitas-Solana Beach Coastal Storm Damage Reduction Project could result in the destruction of Los Peñasquitos Lagoon and expose nearby communities and visitors to the Torrey Pines State Natural Reserve to West Nile Virus and other forms of vector-borne brain encephalitis. 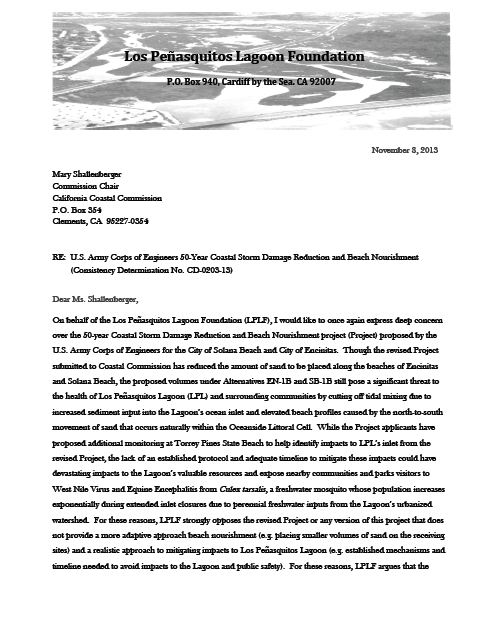 Please click on the links to see letters of concern submitted to the California Coastal Commission regarding this project. Also check out the short video below that provides first-hand accounts of living with debilitating effects of brain encephalitis.